FCA seems determined to fight its self-created demons with heavenly horsepower figures and no roof. Anger is such a powerful emotion. It enables its infected subject to subvert pain, fear, and logic and gives them seemingly endless amounts of energy with which to level anything in their path. It’s why Dodge uses such aggressive words to address its angriest cars, the Charger, Challenger, Hellcat, and now, the Demon. But any good warrior knows that anger clouds judgement, and the only way to consistently win battles is to come from a place of peaceful yet purposeful and focused will to defeat the forces of evil. Fiat Chrysler seems to recognize this, and it’s latest patent, pointed out by Fiat Chrysler Authority, gives us a look into FCA’s bewildering story that literally involves Angels and Demons. On July 17th of this year, FCA filed a trademark for a model named “Angel” with the United States Patent and Trademark Office (USPTO), specifically slotted under the section covering “Motor vehicles, namely, passenger automobiles, their structural parts, trim and badges.” Just what on Earth is FCA planning? There’s no way of knowing, but Motor Authority postulates that it might be something endowed with hellaciously high horsepower numbers bundled into a feel good package that’ll give pacifists a way to enjoy performance while remaining in their places of zen. The fact that the patent was filed so recently means that any physical manifestation of the Angel, be it a trim level, package, or model, only exists at top secret testing grounds and won't be seen on the roads until at least a few years from now, but that happens to coincide with when FCA will unveil its new flood of muscle that comes (hopefully) powered by Hemi V8s. 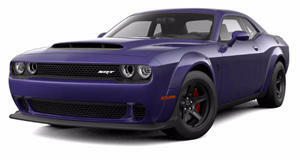 Within a few years, Dodge will phase out the current Challenger, which has been around for an almost alarming nine years, and replace it with a successor. Phase two of those plans will be embodied in a lightweight convertible with the handling capabilities to match or surpass the Ford Mustang and Chevrolet Camaro. A name like Angel would be perfectly suited to a drop top that brings its occupants closer to the heavens if FCA doesn’t go with the Barracuda or ‘Cuda names it’s recently patented. Keep it up FCA, we like this renewed sense of confidence.